Sparkling wine from Giorgio Clai? Anyone who knowes his wines belives that this must be something special. Looking for aperitif, which would encompass his offer, the decision was made to start a production of sparkling wine made by tradicional (champenoise) method. Beside Chardonnay, for the first time Giorgio used Plavinu, variety which shows excellent for the production of sparkling wines. His first sparkling wine from the vintage 2010. immediately became one of the best Croatian sparkling wine. 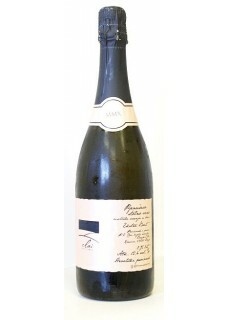 The main characteristic is freshness, where Clai getting close to real "champagne", which feels at first sip. Extremely dry (extra brut), a beautiful body and optimal contents of alcohol. Food pairing: Fresh oysters, raw seafood.